You are currently browsing the archives for the tag 'puig'. The name Nina Ricci is famous, especially the house’s most famous perfume, “L’Air du Temps” (created in 1949), but the brand has dropped off the fashion radar for quite some years. The French fashion house was founded by Maria “Nina” Ricci and her son Robert in Paris in 1932, and has been owned by the Spanish beauty and fashion group Puig since 1998. After Maria Ricci’s death in 1970, the label went through a difficult phase, with different owners and designers. In 2009, designer Peter Copping, who had worked for Louis Vuitton, took over and since then Nina Ricci has been on the rise again. I absolutely adore Peter’s designs. When designing the F/W 2012 collection which will be presented this Thursday during Paris Fashion Week, Peter Copping, Creative Director of Nina Ricci, asked himself what the Nina Ricci uniform would be. First and foremost among the house codes is the little black dress. Ruched taffeta and lace dress by Nina Ricci, tweed and leather jacket by Antonio Berardi, Black Mamba gold-plated snakeskin-effect cuff by Yves Saint Laurent, studded leather ankle boots by Valentino and Constance leather clutch by Jason Wu. Tweed materials are another house signature; here Copping whipped them up in a feminine and soft style. Combined with a floral skirt, it takes your summer wardrobe to the next level. Tweed coat, open-knit crew-neck sweater, mini pansy-print skirt, ruched linen wedges and Liane top handle bag, all by Nina Ricci. 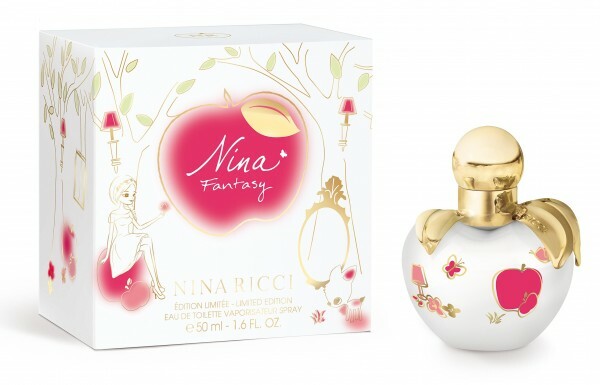 For all perfume lovers, I recommend Nina Fantasy, a gorgeous Limited Edition version of her classic Nina fragrance, which will be availbale in Switzerland in April, just in time for spring. Slightly sweeter smelling than the original, the scent combines top notes of bergamot, mandarin and pear with the delicate, powdery heart notes of cherry blossom, rose and heliotropes. Base notes are mate and brown sugar. The white procelain bottle in the shape of a flamboyant apple is very fairytale-like. It draws inspiration from spring and magical moments. It is finished with a golden stem and leaves, engraved with the Nina Ricci signature, and has some sweet illustrations in golden pink.